The African Centre for Biodiversity recently examined South Africa’s smallholder support programs. These funds are supposed to serve 300,000 smallholder farmers in the country and enhance their ability to feed themselves and their communities. 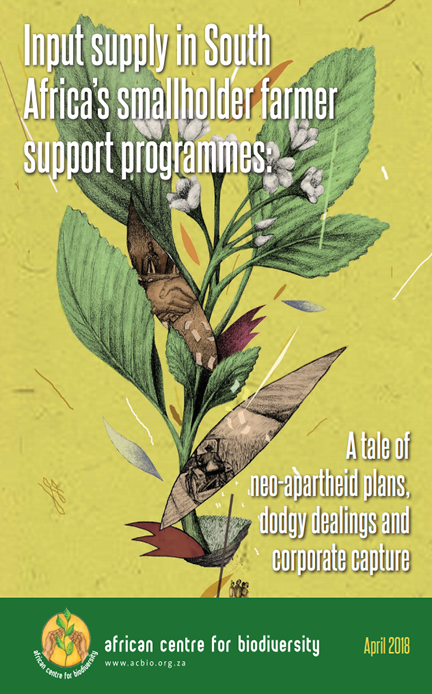 Their report,“Input supply in South Africa’s smallholder farmer support programmes: A tale of neo-apartheid plans, dodgy dealings and corporate capture” shows a lack of government transparency, pro-corporate policies, and the use of GM seeds in farmer support. 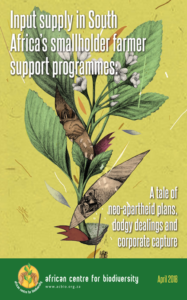 The history of South Africa’s agriculture started with colonialism, with the majority of white farmers operating large-scale commercial farms and black farmers working small farms. Unfortunately, this pattern has mostly persisted into the current day. Although there are a number of farmer support programs including land access, extension and training, production support, input supply, mechanization, irrigation, financing, infrastructure and market support, the research focuses on agricultural inputs (specifically seed, fertilizer, and pesticides) since this is the area where corporations benefit the most. As producers of seed, fertilizer, and pesticides, corporations benefit from public subsidies that are meant to support small farmers. Monsanto and the Water Efficient Maize for Africa project are prominent beneficiaries here. Read more about South Africa’s farmer support programs on the African Centre for Biodiversity website here.